Description: Extreme G takes place in a deserted waste land set deep in the future. Racing blazing fast futuristic remote control Motorcycles is the top sport in this era. Play through 3 championship leagues including Atomic, Critical Mass and Meltdown. There are over 20 tracks to race at. 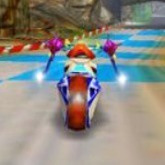 There are a lot of unlockables such as hidden levels, bikes and more, they can be unlocked by defeating the championships on various levels of difficulty. Overall is this is a fantastic fast racer that was very popular in the 1990's and is still fun today! Game Controls: Enter Key = Start Button. "W, A, S, D Keys" = Move. Hold "Space Bar" Key = accelerate. "K" Key = use weapon. "L" Key = boost. "J" Key = Brake. See In-game Controls to edit them, by clicking in-screen for more options.